A variety of equipment can be used to transform landscapes on today’s jobsite. From skid steers to compact excavators, there is always a machine that can tackle the most difficult tasks. While these machines are useful, purchasing construction-grade equipment may not make sense for your business. For simple, everyday earth-moving jobs, contractors may already have a solution in their fleet: a compact utility tractor. Often looked at as a machine for large property maintenance, compact utility tractors can be equipped to perform almost any job through a variety of implements. From power rakes to loaders, compact utility tractors can easily tackle those difficult dirt jobs without a huge expense or a need for extra fleet space. With a wide range of implements and attachments available, contractors should select a few essentials to invest in. 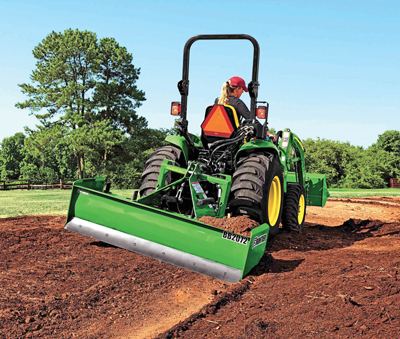 For dirt-focused applications, we have developed a list of what contractors should consider purchasing to get the most out of their compact utility tractors. One of the most popular implements in the contractor segment, a loader transforms a compact utility tractor into a heavy-lifting machine. From moving dirt to carrying heavy materials like gravel, loaders offer the benefits of a specialized machine like a skid steer without the added cost of owning one. Additionally, loaders can be transformed with a variety of attachments, like grapple buckets or light material buckets, allowing operators to perform tasks like picking up tree stumps and branches or moving large amounts of light fluffy material such as tree bark or mulch. When purchasing a loader, select a solution that meets your business’ needs. What are you planning to do with the loader? For example, do you need to load materials into a truck? 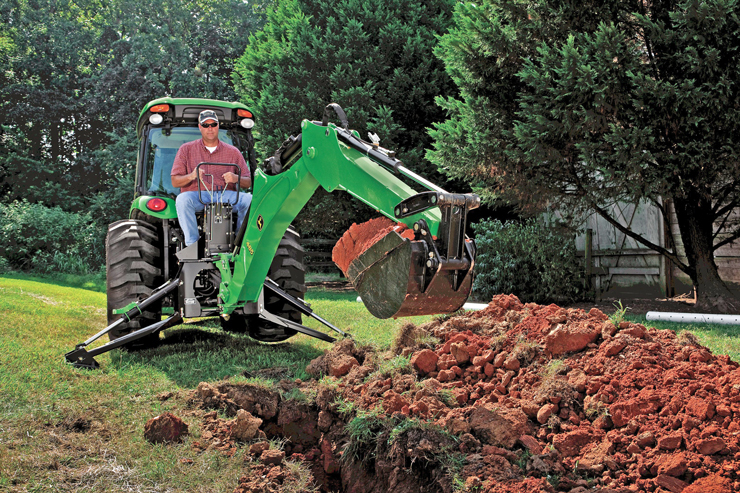 Look for a loader that boasts the reach necessary to do so. Other factors include bucket breakout force, cycle times and lift capacity. Once you pick a loader, consider the other tasks you may encounter on a jobsite. Should you invest in those additional attachments? Many contractors find value in attachments like pallet forks or multi-purpose 3-in-1 buckets. Regardless of your situation, there is an option that can meet your needs. Do you regularly work on projects with tough soil conditions? Do you ever need to mix soils together for seedbed preparation? Do you need to loosen soil prior to finish grading? Consider a rotary tiller. Rotary tillers are multi-purpose tools that can tackle everything from small flowerbeds to large lots and fields. They can help with weed control, soil mixing, soil aerating, soil leveling and many other tasks. Do you think you will be using the tiller frequently in rough environments? If so, look for a heavy-duty model that can withstand the most difficult tasks. Pay extra attention to the frame and gearbox, which will be absorbing most of the stress from the job. If you only plan to use the tiller every once in a while, you may be able to save some money by purchasing a lighter-duty version. If your company is regularly tasked with projects that require cleanup, grooming or material spreading, consider purchasing a landscape rake to simplify the job. Standard-duty rakes can be used on lower horsepower tractors for smaller jobs like spreading loose gravel or grooming a sod bed. If you think that a task is going to be more difficult, look at medium-duty rakes that are constructed with a heavier frame and stronger tines. If you regularly work with challenging soils that are covered with rocks or other debris, a power rake may be the best solution. Power rakes incorporate several tools into one. They can be used as blades for grading, landscape rakes for clearing or as pulverizers for breaking up tough clumps of soil. They have special features to simplify the job, like adjustable gauge wheels to control depth, hydraulic angling and roll-back barriers to control the level of pulverization. Another tool for grading is a blade. Most manufacturers offer a variety of blade solutions depending on your application. Rear angled blades are ideal for smoothing surfaces by forming windrows of material and moving them across the jobsite. Just like many of the other implements we have discussed, rear angled blades are offered in both standard and heavy-duty configurations and they can be optioned with hydraulic angling to allow for adjustments on the go. Box blades are another solution that allow contractors to easily grade and level dirt. They are one of the more common implements found on a jobsite. Box blades work differently than angled blades because they are able to carry a stockpile of material along with them as they move across the site. While grading, if the box blade passes over a low spot, it will deposit some of the material that it is carrying to bring the surface up to grade. If the box blade passes over a high spot, it will cut some of the material away and add it to the stockpile to bring the surface down to grade. For tougher conditions, some box blades have built-in scarifier teeth to help loosen the soil prior to the blade passing over it. Combining power with excellent visibility and precision, backhoes are typically used for installing underground utilities or for moving large amounts of soil below grade. 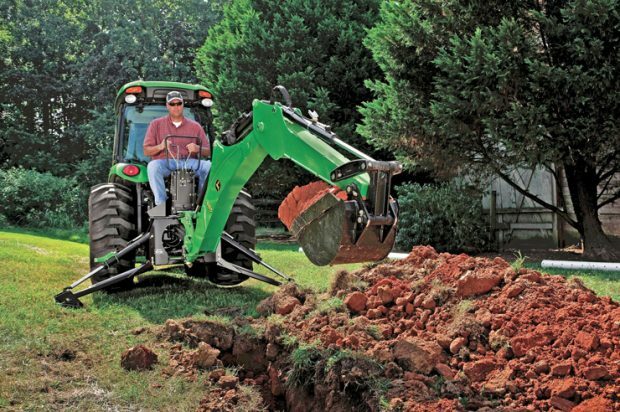 Depending on your needs, you will want to select a backhoe that offers the digging depth and digging force needed to complete the job at hand. For added ease, look for a model that has a quick-attach system that will allow you to connect the unit to your tractor within minutes. Now that you know your options, how do you determine which implements are right for your business? First, reach out and talk with your equipment dealer. Not only will they be able to determine which tractor is best for your desired application, but they also will be able to outfit it with the right implements and help guide the financing/payment process. 1. What is the job or intended application? What is the terrain of the jobsite like? 2. Is this a one-time task or do you anticipate similar jobs in the future? 3. What are your budget parameters? Have you considered financing? Once you select the tractor and implements you want to purchase, work with your dealer to identify the best payment method for you and your business. Often times dealers will allow you to include implements in addition to the tractor in financing plans, so it is advantageous to find a dealership that can offer you everything you need in one stop. By choosing the right implements, contractors can elevate their compact utility tractors into multi-purpose machines. Assess your options, do your homework and chat with your dealer. Your compact utility tractor will be doing different tasks before you know it, and your bottom line will thank you. Jared J. Lowe is a product marketing manager of compact utility tractors with John Deere Commercial Products.